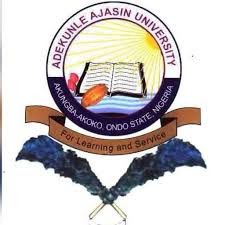 The pioneer First Class graduate in the Department of Earth Sciences of Adekunle Ajasin University, Akungba Akoko, Ondo State, Mr. Olumide Taiwo, has advised students of the institution to work hard, saying there is no short cut to achieving real success. He gave the advice during an interactive engagement with a cross-section of students of the Department on campus. Mr. Taiwo came to campus in company with his colleagues from Chevron Corporation to donate some materials which he facilitated to AAUA. Responding to questions on how he set a first-class record in the Department in 2008, Mr. Taiwo said, “I want to attribute whatever I am and have to God because He is the giver and sustainer of life and everything. “My advice to all students is to put in their best. Everyone in my set took academic very seriously. Almost immediately we resumed, we started night class. We didn’t go there to joke or throw banters, but to do serious reading. From the start to the end of my own story about academics, is there are no short cuts; you just have to put in your best. That was exactly what I did and of course, the grace of God supported. I said to myself that I was going to make a First Class and it happened. “Back in the days, in the front of all my books, I wrote, “Greater than or equals to eight”. For me, that’s very symbolic. It’s my daily reminder that, “Have I done serious study today?” so, even if I am dying, I must do at least, eight hours of studying. The minimum I had daily was eight hours. Of course I did more most times. No short cut, you can be whatever you want to be. On why he has decided to give back to AAUA, an unassuming Mr. Taiwo, said, “Well, I believe that if you’re blessed and your blessing is not a blessing to other people that is not a blessing. Right from when I was on my Master’s programme, I have been encouraging many of us to come back and give to the university, but a lot of people have been lethargic about this because of their bad experience on campus.